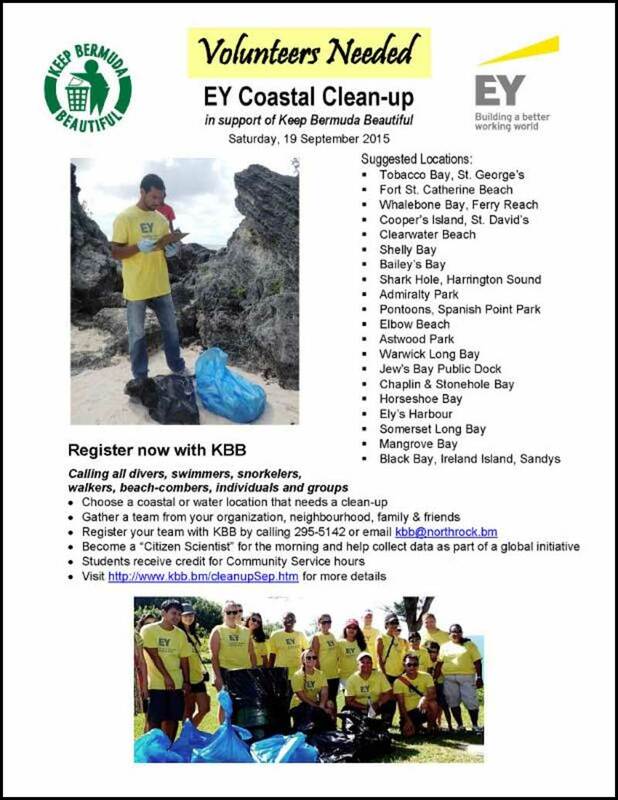 Keep Bermuda Beautiful [KBB] is calling for volunteers to assist with the upcoming EY Coastal Clean Up, set to take place on Saturday, September 19. The event poster says, “Calling all divers, swimmers, snorkelets, walkers, beach-combers, individuals and groups. Choose a coastal or water location that needs a clean-up, gather a team from your organization, neighbourhood, family and friends, and register your team with KBB by calling 295-5142 or emailing kbb@northrock.bm. Suggested locations include Tobacco Bay, St. George; Fort St. Catherine Beach; Whalebone Bay. Ferry Reach; Cooper’s Island, St. David’s; Clearwater Beach; Shelly Bay; Bailey’s Bay; Shark Hole, Harlington Sound; Admiralty Park; Pontoons, Spanish Point Park; Elbow Beach; Astwood Park; Warwick Long Bay; Jew’s Bay Public dock; Chaplin & Stonehole Bay; Horseshoe Bay<; Ely’s Harbour; Somerset Long Bay; Mangrove Bay; and Black Bay, Ireland Island, Sandys.